The annual Friends of King Alfred Buses (FoKAB) running day had traditionally been held on January 1st over many years. Now the event has moved to the warmer days of spring, with the 2016 event taking place on the evening of Saturday 30th April and all day, Sunday 1st May. The independent transport videos cameras were on hand to record the event for you to enjoy. On the Saturday evening a network of ten routes were operated using four former King Alfred buses from 1700hrs until the final journey finishing in the Broadway at 2107hrs. Our filming starts on the Broadway as we board WCG 104, a 1959 Leyland Tiger Cub with Weymann bodywork for the service 3 journey to Lower Stanmore and back. Our next ride is on board POU 494, the 1956 Leyland Titan with East Lancs body for the 11 service to Worthy Down MQ. As the daylight fades we travel along with the tungsten bulbs glowing adding to the atmosphere and the sounds of the Leyland engine! More filming is done on the Broadway before boarding a 1964 Park Royal bodied AEC Renown, 595 LCG, travelling to the Springvale Hotel on service 18. Filming for the evening concludes on the Broadway as twilight falls. Sunday 1st May dawns with bright sunshine as we begin our filming at the St Catherine’s Park & Ride site, which is the base for the visiting vehicles and the starting point for all non King Alfred services. All routes served the Broadway, with the King Alfred buses starting and finishing there. This made the day ideal for photography, as you will see, adding realism to recreating the past. We arrive at the Broadway on board former Hants & Dorset, semi-automatic Bristol Lodekka FLF, 1577 (LLJ 443F) with an ECW body dating from 1967. A good deal of our filming records the continuous action on the Broadway, but also in the Bus Station, Friarsgate, Eastgate Street and Bridge Street. Apart from the large FoKAB collection of buses and coaches there are over twenty preserved buses and coaches to see in service. Some of the former operators seen are Hants & Dorset, Wilts & Dorset, Southern Vectis, Provincial, London Transport, Royal Blue, Silver Star and Southdown. An excellent event - well done to the FoKAB team for organising the day! To conclude our programme we have some cine film from the camera of Bob Gray featuring King Alfred buses in action. The first sequence was filmed by Bob in April 1973, where we see King Alfred buses in service prior to their take over by Hants & Dorset on the 30th April 1973. The next sequence was filmed in January 1980 when a ‘King Alfred Memorial Tour’ was organised using Leyland Panther UHU 418H, now numbered 2698. Seen in Poppy Red with Hants & Dorset fleet names, it has a white image of the King Alfred logo affixed to its sides! The final sequence was filmed by Bob in Winchester in May 1980. Not a single King Alfred bus in sight, just Hants & Dorset Bristol Lodekka FLFs, Leyland Nationals and new Bristol VRTs! 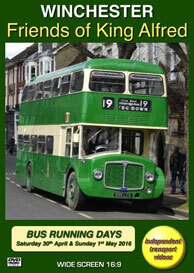 We hope you enjoy this journey into the past – reliving the days of King Alfred buses.